The survey has been conducted in the market which revealed top 30 downloaded and the excessive used apps on the Android and iOS app stores. The social media apps are provided in the mobile games in the first half of 2016. It is also said that only 2 games were able to include in the top 10 most downloaded apps. There are two games, which are present on this list and they are Slither.io and Color Switch. In this survey, the newly introduced game, Pokemon Go is not included as this game was introduced on 6th July. On the social media app, the first ranking app is Facebook Messenger and it is added with Snapchat at the second position, Facebook on the third and Instagram at the fourth and Color Switch is at the fifth position. 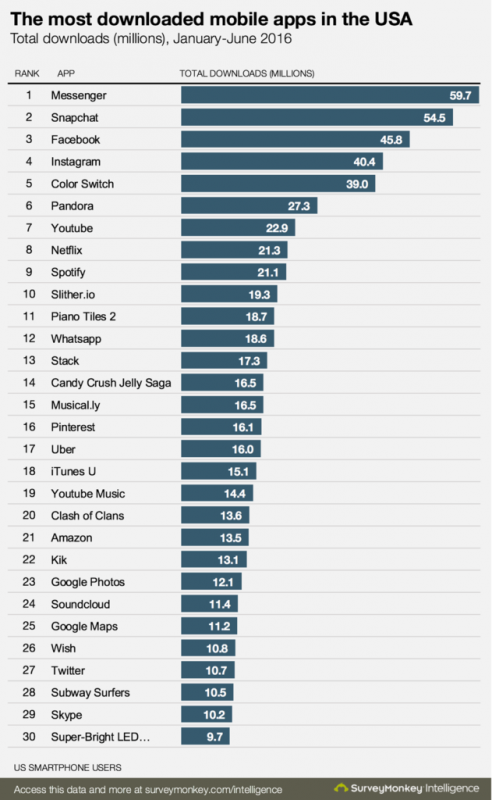 The viewers can watch the graph, which show the 30 most downloaded mobile apps during the first half of 2016. 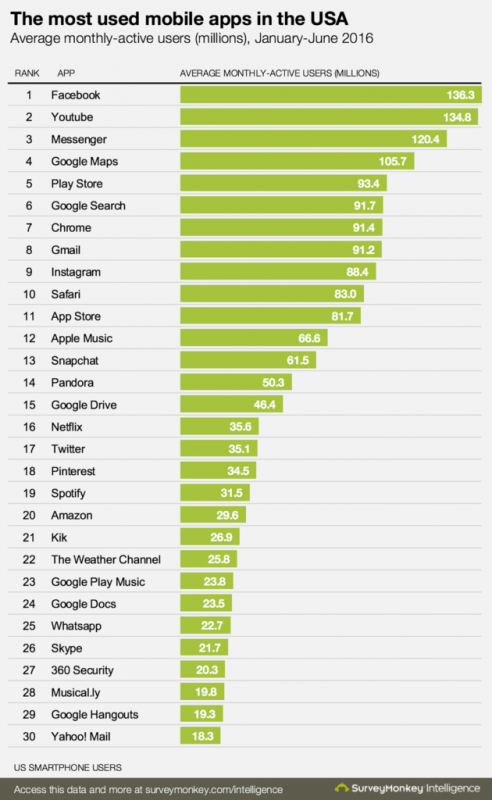 When we check the most used apps section, we find the most used apps in which 5 top positions were grabbed by Facebook, YouTube, Messenger, Google Maps and Play Store. On the first 12 apps, you will find that Google, Apple or Facebood grabbed the position with their different apps. You can find the mobile phone app of Snapchat, which is present at the number 13. The users will find 40% of the most used apps, which are loaded on the mobile operating system. The research shows the main reason for introduction of the most used apps, which are owned by Facebook, Google or Apple as they are pre-loaded in the excessive number of devices and they hit the market. These apps are translated and are downloaded from the app store. It highlights the importance of iOS and Android to Google and Apple. The most used apps become the most downloaded apps but it is not necessary that most downloaded apps are the most used apps. The main reason is that the games did not reach to the top of the charts and no specific game is dominant. The mobile phone users like to play the games on their mobile phones but they are released on the app store with dozen of titles. It become difficult to keep up with everyone so very small number of games is the most used.